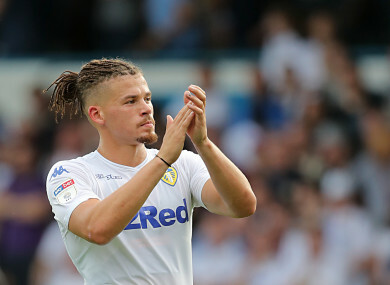 Kalvin Phillips scored late for Leeds on Saturday. KALVIN PHILLIPS’ HEADER in the 11th minute of added time salvaged a 1-1 draw for Leeds United at Middlesbrough to send them to the top of the second tier Championship on Saturday. “What we know is that he didn’t feel well,” Leeds manager Marcelo Bielsa said. The draw sends Bielsa’s side a point clear of Norwich at the top though the Canaries can reclaim that position if they beat East Anglian rivals bottom-placed Ipswich Town on Sunday. Sheffield United lie in third position — three points off Leeds — after missing a golden opportunity of going top themselves surrendering a 3-0 lead on Friday to be held 3-3 by Aston Villa. ‘Boro had taken the lead through Lewis Wing two minutes into the second-half, slotting home from George Friend’s cut-back. Leeds — who have had a poor run of late losing four of their last six matches coming into Saturday’s game — should have levelled in the 71st minute. Patrick Bamford returning to his former club — for whom he scored a hat-trick against Leeds last year — fired wide from four yards out with the goal gaping. Middlesbrough’s Ireland goalkeeper Darren Randolph also kept the hosts noses in front with some stunning saves, thwarting Kemar Roofe twice. Email “Phillips' dramatic 101st-minute equaliser sends Leeds top of the Championship ”. Feedback on “Phillips' dramatic 101st-minute equaliser sends Leeds top of the Championship ”.